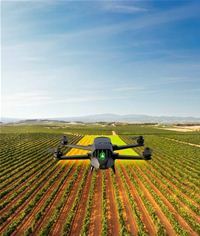 Parrot Bluegrass is a multipurpose quadcopter designed for agriculture professionals, and helps farmers improve their ROI, using its two embedded cameras; video camera and multispectral sensor. With its front Full HD video camera, this solution lets users visually monitor the farm’s infrastructure, land and herds. It also enables farmers to get a full overview and detect problem areas in all types of crop fields quickly and efficiently, thanks to its multispectral sensor designed for Precision Agriculture, Parrot Sequoia, and the easy to use processing cloud platform – AIRINOV FIRST+. Parrot Bluegrass can automatically cover up to 30 hectares at 70 m / 230 ft. flight altitude per battery use. It can also fly at low altitudes, optimising crops that may require precise mapping. Parrot Bluegrass is a user friendly integrated solution especially designed for farmers. It is easy to set up, easy to fly with its Pix4Dcapture autonomous flight capability, easy to process data with AIRINOV FIRST+, and easy to maintain and repair. A powerful and easy to handle quadcopter equipped with a full HD front camera and embedded Parrot Sequoia advanced multispectral sensor. Parrot Bluegrass is a robust quadcopter weighing just 1.9 kg. It is fully-equipped with a powerful, on-board computing system, as well as embedding the Parrot Sequoia – an advanced multispectral sensor for Precision Agricultural solutions facilitating crop analysis. Parrot Bluegrass includes Pix4Dcapture, the world’s first planning app that enables farmers to precisely define the specific plot they want to map. The user adapts the flight parameters according to the precision needed and the type of crops. The entire flight, from take-off to landing, is automated by the quadcopter and the images captured by its frontal Full HD 14MP camera are streamed live on the screen of a connected tablet. As a multipurpose tool, Parrot Bluegrass can also be piloted manually using the included Parrot Skycontroller 2 Wi-Fi remote control, which provides a 2km range, with the capability to statically hover and inspect. The solution lets farmers observe their crops from new heights and capture video footage of their land, infrastructure or livestock thanks to the drone’s HD frontal camera. Users can also inspect areas that are invisible at eye-level, identify suffering parcels or potential issues that are often missed on the ground. Parrot Sequoia embedded in Parrot Bluegrass provides a complete and accurate multispectral imagery solution for drones that captures images of crops in both visible and invisible spectrums. A multispectral sensor with GPS, that automatically records images of crops in four distinct spectral bands: green (500nm Bandwidth 40nm), red (660nm Bandwidth 40nm), red-Edge (735nm Bandwidth 10nm) and near Infrared (790nm Bandwidth 40nm). A luminosity sensor (‘sunshine’ sensor) that detects lighting conditions and automatically calibrates collected data with the multispectral sensor data during the computer processing phase. AIRINOV FIRST+ online platform enables users to process and analyse the data and images captured by Parrot Sequoia. In just a few hours, the farmer receives a turnkey report composed of orthomosaic NDVI maps (absolute and adjusted) and zoning (simple and detailed). This provides a precise view of the biomass (density of vegetation) and relative health of the crops, helping professionals to determine which areas need specific attention. Professionals can use these insights to understand which areas require the most maintenance and track the effects and evolution of the farm with high precision. With Parrot Bluegrass, farmers and agriculture cooperatives keep the control of the data captured by the quadcopter and the analysis of these data is directly delivered to them, with no intermediary. With the embedded Parrot Sequoia advanced multispectral sensor enables Precision Agriculture mapping and data analysis of crops, combined with Parrot Bluegrass’s ability to fly at low altitude gives optimization for fruit crops. Its front camera, together with the possibility to do static flights, facilitate the observation of livestock or specific areas of land or terrain. Please check local regulations before flying. Parrot Drones is a subsidiary of Parrot, founded in 1994 by Henri Seydoux.